On October 17, 1989, the central coast of California experienced the Loma Prieta earthquake, the most damaging since the 1906 San Francisco earthquake. 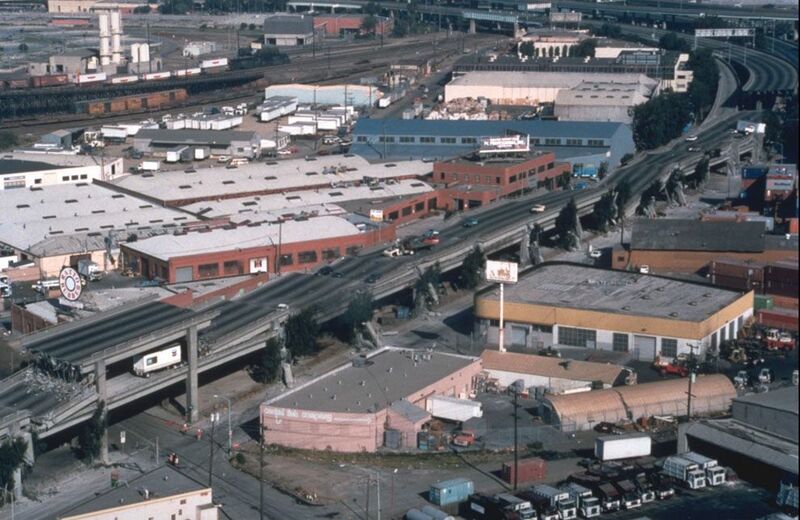 The Nimitz Freeway, in Oakland, California, experienced catastrophic damage during the 1989 Loma Prieta Earthquake. Entire sections of the upper deck of the freeway collapsed directly on the lower deck, instantly crushing more than two dozen cars and their occupants. Photograph by Joe Lewis, courtesy Wikimedia. This file is licensed under the Creative Commons Attribution-Share Alike 2.0 Generic license. On October 17, 1989, the central coast of California was jolted by the Loma Prieta earthquake. The quake’s epicenter was near Loma Prieta Peak in the Santa Cruz Mountains. The magnitude 6.9 quake was the most powerful the state had experienced since 1980. The Loma Prieta earthquake was triggered by the mighty San Andreas Fault, where the North American tectonic plate strikes northward while the massive Pacific plate slips southward. During the quake, the epicenter slipped up to 2.3 meters. The Loma Prieta earthquake caused 63 deaths, 3,757 injuries, and about $6 billion in damage. Many casualties occurred as parts of several transportation routes, including the San Francisco-Oakland Bay Bridge and a busy freeway, collapsed. top surface or "floor" of a ship or other open structure, such as a highway or bridge. point on the Earth's surface directly above the true center of an earthquake. a crack in the Earth's crust where there has been movement. person who reports and distributes news. to extend over or across something. large structure, often used for sports or other entertainment events, with a central event area surrounded by raised seats for viewers. to move in a back-and-forth, swinging motion. 1973: OPEC Embargoes Oil to U.S.